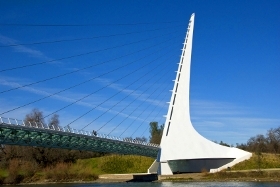 The pedestrian Sundial Bridge at Turtle Bay crosses the Sacramento River, allowing for trail access to the Turtle Bay Exploration Park and McConnell Arboretum. The stunning suspension bridge, designed by Santiago Calatrava, is constructed with an aqua green opaque glass deck, strips of granite and imported white Spanish tile. The 217-foot pylon actually functions as a sun dial - telling time on a tile covered garden border on the north side of the bridge. Stay at Oxford Suites Redding!